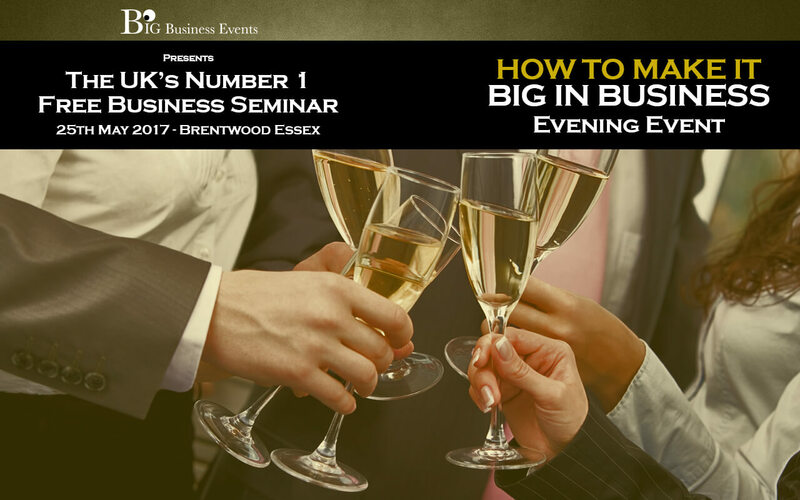 The UK’s leading free business event ‘How To Make It Big In Business’ will be the De Rougemont Manor in Brentwood for an evening of inspiring business speaking and high-quality networking. Reserve your FREE seat – please fill out the form below and click send. Adam will be speaking about how he started his business from start-up to eight figures in sales in just 8 years. He will share the mistakes he made and the tips, secrets and strategies he used to overcome them as well as giving you advice on how you can create more profit and achieve growth in your chosen market. As you can see from the video, Adam is passionate about helping other business owners create success in business! This free event will start at 6 pm with a complimentary Champagne reception. A short and detailed talk by Big Business Events and Big Cars Ltd Founder Adam Stott. Adam will be joined by Raw Talent Academy Managing Director, BBC ‘The Apprentice’ winner and Co-Founder of Big Business Events, Lee McQueen and Entrepreneur, TV Presenter and Racing Driver Rebecca Jackson. Our hugely popular and unique approach to business networking will be one of the main features of this event.